Mallorquina is a delicacy originating from a 16th century recipe from the Balearic island of Mallorca. Traditionally hung around the fireplace to cure, it develops a smoky aroma whilst retaining the sweet notes of the meat. The Mallorquina comes in a large natural skin, average weight is 2 kg. 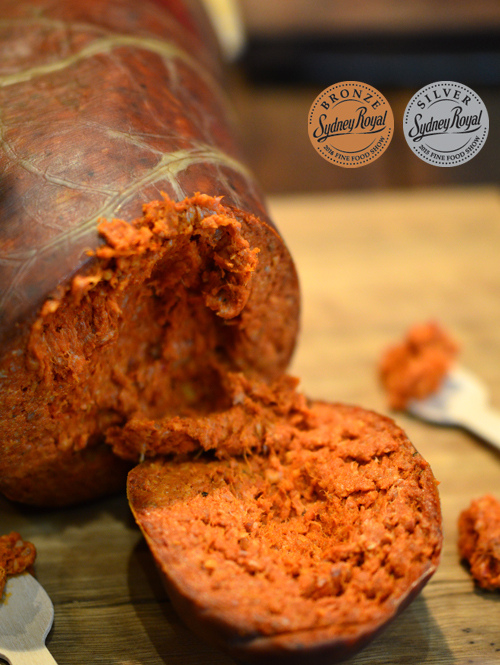 Sweet spicy, smoky spreadable fermented salami. Traditionally served on unsalted bread. Keeping to the standards of Mallorca, with no additional colouring, all flavour notes come from the traditional spices used in its original manufacture. This product is perfect to be held at 18 degrees or below. Its maturing cycle allows for it to be eaten at 10 weeks of curing, though flavours develop and blossom as it continues to mature.